The best white chicken chili ever! Rich and creamy and topped with an avocado cream that is to die for! Beans, chicken, peppers, onions, cumin, oregano, coriander, onions and more simmer all today together in the crockpot. Makes a lot, perfect for freezing, tailgating or parties! Are you a white chili person or a red chili person? I admit it, I would never turn down any bowl of chili, but I love a good white chicken chili. There is something so comforting about a big bowl of white beans that have simmered all day with chicken and lots of peppers and spices. Then when you take that chili and top it with an avocado cream, it’s over the top amazing! Beans – dried white beans (cannellini and garbanzo.) Can use canned, just drain and rinse. Chili Peppers – serrano and jalapeno peppers. Seed them if you don’t want it too spicy. Onions, Garlic, and Chicken Stock – yellow or white onions and unsalted chicken stock. Chipotle Chili in Adobo Sauce – you’ll only use one chili. Wrap the rest individually and store in a ziploc bag in the freezer. Cilantro Stems and Leaves – reserve the leaves for garnish! Dried Cumin, Oregano and Coriander – I try to use organic. Boneless, Skinless Chicken Thighs – can use breasts if you want it a little lighter. Fresh Corn – can use frozen, just thaw first. Half and Half – adds a creamy richness. Lime Juice, Salt, Avocado and Sour Cream – can use yogurt in place of sour cream. If you soaked your beans, they are already in the slow cooker, if not, add your rinsed and drained beans. Then add the two kinds of peppers, onions, chicken stock, adobo sauce and one chipotle pepper from canned chipotle peppers, cilantro stems (save the leaves for garnish,) garlic, cumin, oregano, coriander and chicken. Cook on low for 8 to 10 hours. About 30 minutes before serving, stir in corn and half and half. While that is heating, mash an avocado with some sour cream, lemon juice and salt. Using tongs, shred the chicken, while it’s still in the pot, it will most likely be falling apart anyway! Serve it (in cute soup bowls) topped with the avocado cream and garnished with cilantro. You can use canned beans, just rinse and drain them. Seed the peppers if you want less heat. Can use frozen corn, just thaw before using. Store the leftover chipotle chilis individually wrapped and in a ziploc bag in the freezer. Substitute boneless breasts for the thighs. Use yogurt in place of sour cream if you want it lighter. 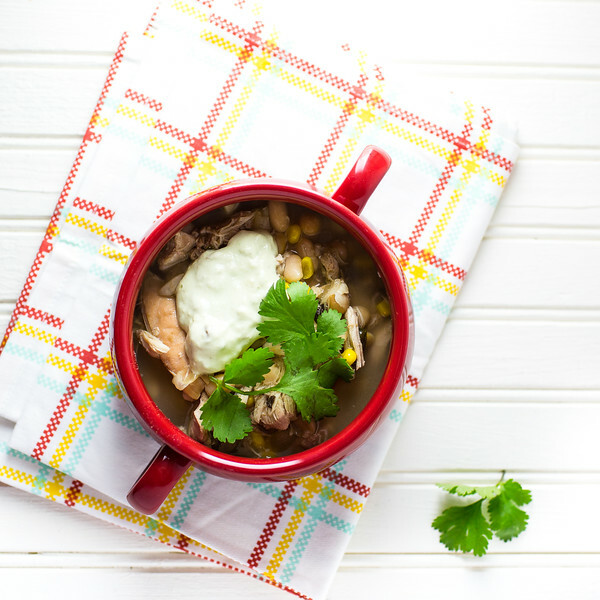 I would love to know what you think of this Slow Cooker White Chicken Chili! Leave a rating and a comment! 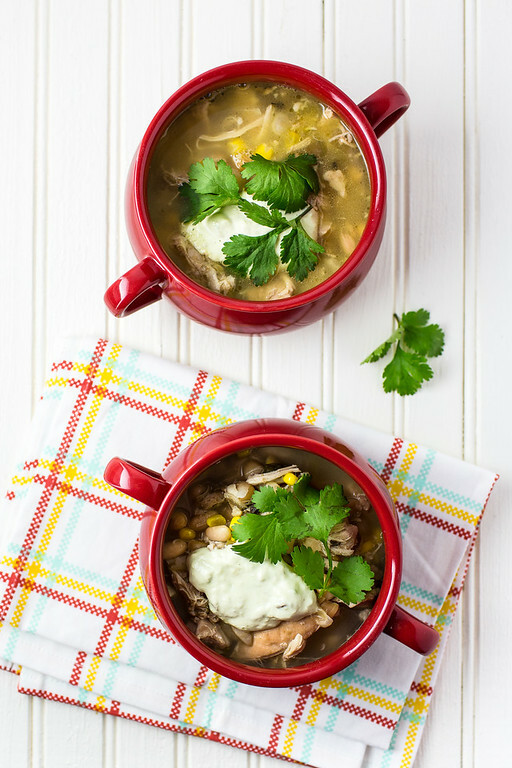 This Slow Cooker White Chili Chicken with Avocado Cream is so full of flavor! Place dried beans in slow cooker and add water so that the beans are covered by about 2 inches. Soak overnight. In the morning add the rest of the ingredients up to and including the chicken thighs. Cook for 8 to 10 hours on low. About thirty minutes before serving stir in the half and half and the corn. In a small bowl smash the avocado with a fork and add the sour cream and 1 1/2 teaspoons of lemon juice and a sprinkling of salt. Stir to combine. Using tongs shred the chicken (it should be falling apart anyway). Taste the chili and add salt and pepper to taste. Serve topped with the sour cream and the cilantro. I’ve made a white ragu before but not a white chilli. This looks really yummy and will definitely be trying it soon. This is such a delicious and yummy Instant One Pot Meal. Such lovely and healthy ingredients to it. Love the Avocado Cream option too. I’ve never had white chilli but I’m starting to think I could be a white chilli kind of girl! You can’t beat chilli for some comfort food. Love the sound of the avocado cream too. I have never had white chili but I know my family will love this! Looking forward to that avocado cream. What a great recipe Pam, this looks delicious! Hope you are having a great week and thanks so much for sharing your awesome post with us at Full Plate Thursday. We look forward to seeing you again real soon! I like the recipe and dang, those colors really pop in your pictures! Thanks so much for sharing your awesome Chili with us for The Texas Star Chili Cook Off 2016! It’s seems like a hearty meal without being heavy. Pretty looking too. Dear Pam, This sounds wonderful! What a perfect meal to enjoy on a cold day like today…I would love a bowl of this. It is perfect for this colder weather! I love white chili…I love that your version has avocado cream. Avocados are a staple in our house! I know! This avocado cream is definitely a keeper!